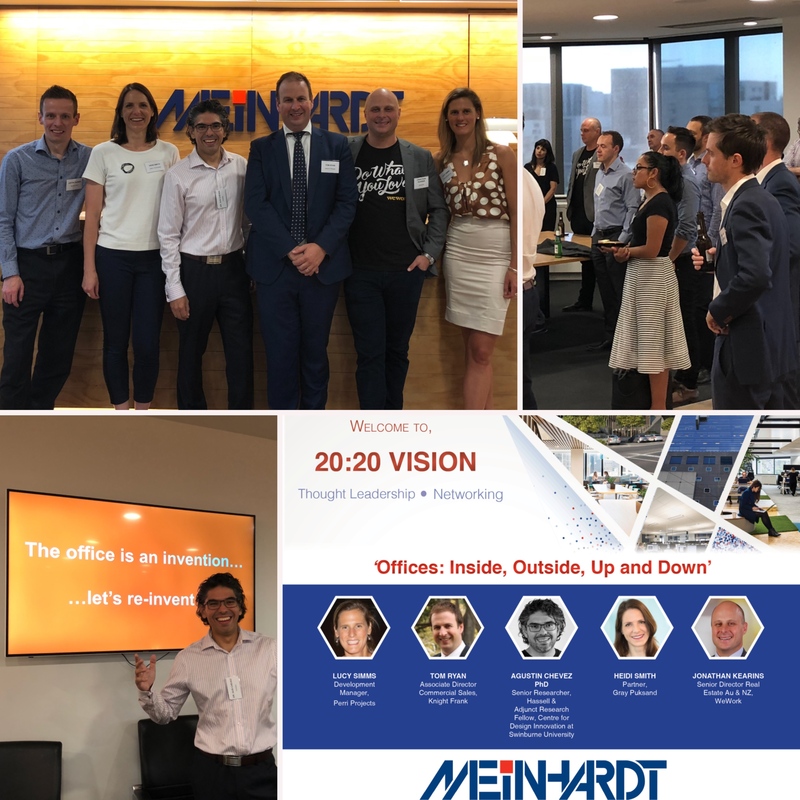 Meinhardt hosts its first 20:20 Vision event for the year 'Offices - Inside, Outside, Up and Down' in Melbourne. Home, office, home, sleep and repeat. With the demise of the 9-5 working day and the ever increasing interconnectedness of the 21st century- something’s got to give. According to our expert panel at last week’s 20:20 Vision, that something is the humble office. The office sits at the centre of both our working and personal lives. It impacts how we perform at work and also how we balance our work with home life, social life and recreation. Of late, office layouts have seen massive transformation. From the traditional, old, isolating and boring to the bright, collaborative, interactive and disruptive spaces we see today. We can attribute some of this inspiration to Silicon Valley and their start-up model offices (think Google, LinkedIn, Facebook, SnapChat). Then there’s the evolution of tech- constantly evolving and requiring the spaces and infrastructure around it, to be ever evolving too. Enough said on that. We also have the rise of the entrepreneur and the changing workforce, where traditional roles are but a thing of the past. Oh and did I mention the lack of availability for space within CBD’s? For engineers, developers, architects, designers and employees, the humble office therefore leaves us asking- where to and what to next? Design- think utility and significance. Environments should be designed to give meaning and serve needs. Story- create context and emotion. Information, knowledge, content and emotion are all tied together with spaces. Symphony- synchronise and connection. Thriving in the conceptual age means understanding the connections between diverse and seemly separate disciplines. Empathy- compassion and relationships. Creating spaces that meet the needs of a team but which also inform others of required behaviour(s). Play- socialise and joy & Meaning- purpose and value. Essentially every office should have billiard tables and sun lounges…right? Workplaces want flex-work, co-working, agile work; developers need to be flexible too. Wellness, breakout spaces & meeting areas- account for the link between well-being and productivity. Place-making- contribute to the public realm and score the balance between day time, lunch time, night time trade. Vertical Communities- bringing vertical eco-systems to buildings and the co-living concept (helps with that CBD space issue too). Energy and sustainability through analysis and smart layout. The office is an invention- there is no cookie cutter guide to creating the perfect office. Ways of working have changed and evolved and offices look and function differently. Think ‘Hoffice’ yes, that’s the home office. Research is currently being undertaken to track movement around offices and also to monitor and design around the ‘sound of collaboration. Super interesting stuff! It’s as simple as this- inexpensive adjustments to the way a space looks and feels can be the difference between vacancy and lease. The market shows that there is strong tenant demand from all sectors; increased inquiry and flight to quality. Tenants will upgrade to stay competitive and move out of the CBD to reduce costs. Key tenant drivers to a location: cafes, gym, childcare, transport, parks and shopping. Key tenant drivers to a building: natural light, end of trip facilities, car parking, flexible floor plates, energy efficiency and ease of access. There’s a new workforce- think community, urbanisation and sharing. It’s the era of the agile entrepreneur. Workspace is more than a lease, it’s about relationships with space- collaboration, cultural fit, improved productivity and staff benefits. People want to be surrounded by like minded workers. They want to grow together, the market has seen a 70 per cent increase in spending on experiences. Whilst I think there will always be a place for traditional lease- collaboration isn’t just between people of the same company but also between the companies themselves. So all in all, there does seem to be some sort of key to nailing the perfect office but it’s not the architects, or the engineers or the developers or the designers who hold this key- it’s the tenant. Yes, we can create nice spaces and surround them with facilities and fill them with natural light. But, if the tenant can’t culturally align to a space, then how can the office really fulfil it’s potential?